In this video session, we will learn about different ways to replace NULL values in SQL Server. Please watch Part 14, before continuing. In Part 14, we have learnt writing a LEFT OUTER SELF JOIN query, which produced the following output. 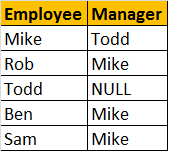 Replacing NULL value using ISNULL() function: We are passing 2 parameters to IsNULL() function. 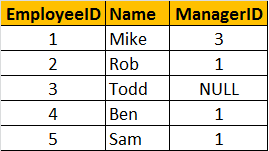 If M.Name returns NULL, then 'No Manager' string is used as the replacement value. Replacing NULL value using COALESCE() function: COALESCE() function, returns the first NON NULL value. This is an excellent tutorial. I did not understand COALESCE() function much, however, I wish that I will get to know that in future videos as you mentioned. Thank you much, Sir!!! Thank you so much Vekant , videos are very helpful to understand basic..
Keep it up great !! !